The views of Ross-on-Wye are backed by Penyard Hill and Chase Hill. Being as these were both good defensive sites, these were both populated before the lower areas were inhabited. In south Herefordshire, the earliest signs of habitation are cave dwellings dating back to the Upper Palaeolithic period (10,000BC to 8,000BC) on the Doward but there may have been earlier habitations but no evidence of these remain. The area was only lightly populated until around the Bronze Age (2,000BC to 700BC) when pots and flint items are found in the area surrounding Ross. 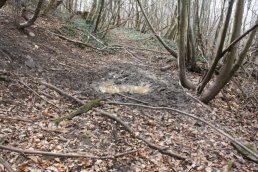 On Chase Hill, in the last few years there have been various sightings of wild boars and they are most likely to be seen at down or dusk when they go rooting around the woodland. They normally eat plants but but they will eat basically anything that comes within range. These secretive animals and are often mistaken as dogs when seen in the distance. "Official" advice is not to approach them and just to get out of their way. Wild boars are most likely to attack in autumn, during the mating season, or during the spring when the females have piglets. 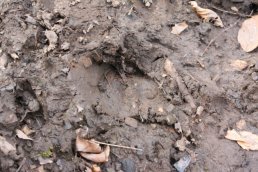 Whilst walking over the Hills signs of Wild Boar can be seen mainly in the form of imprints in the mud and occasionally wallowing holes. 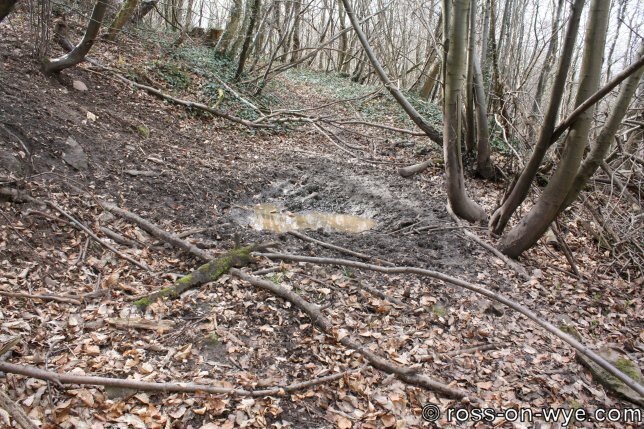 The pool below seems to have formed in an area that was once a charcoal burners pit. The soil in this area, normally very shallow and primarily comprising of loose red sand, is black and relatively well bonded together. 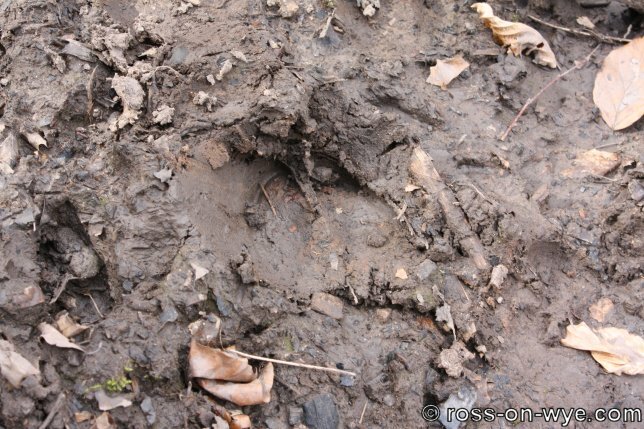 There are distinctive foot marks around the pool and a definite sign of where dark mud has been spread along a well defined run as boar have left the pool.